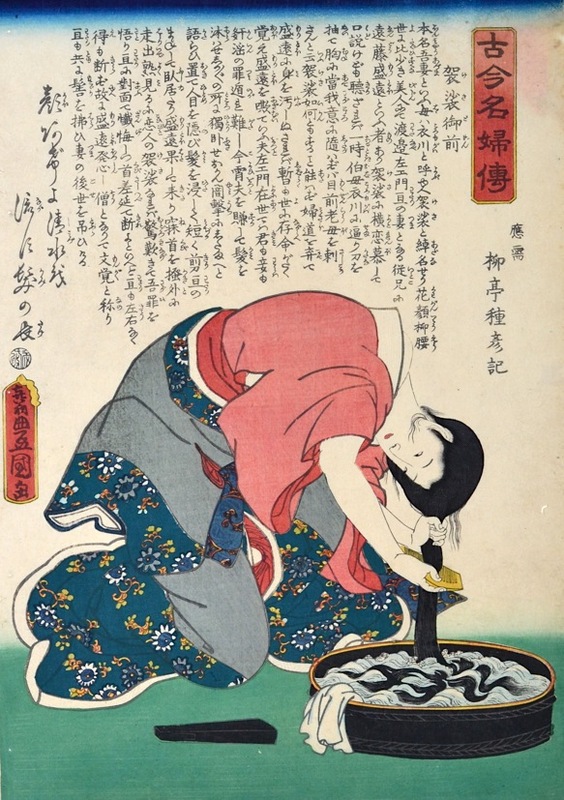 Utagawa Kunisada/Toyokuni III (1786-1865) Stories of Loyal Women of All Time (Kokon Meifu Den): Kesa Gozen Washing, c.1855. Oban. One of Kunisada’s best and most original bijin prints. The pose here, of a woman ("at her toilet," to use the western convention) washing her hair over a bowl seems to me to predict the celebrated drawings and prints of Edgar Degas of the same subject. Kunisada has created an original and awkward figure engaged in a seemingly ordinary task. The superb draftsmanship reveals a more complex picture, because this is the celebrated heroine and loyal wife Kesa Gozen, calmly accepting her fate and washing her hair prior to cutting it off and awaiting her execution at the hands of her lover. There is a great tenderness in the care she is taking, given that it will shortly be thrown away and there is a great deal to admire in the intimacy of the gestures - the squeezing left hand and the comb held in the right and in the inventive drawing of the water and the floating hair. The turbulence of the water in the bowl in fact suggests her own torment. Endo Morito, the son of a minor courtier became infatuated with Kesa Gozen despite the fact that she was married to a palace guard. He bullied her until she agreed to his advances on the condition that he murder her husband. She concealed herself in her husband’s room having first cut off her long hair. Morito stole into the room and cut off the head of the sleeping figure only discovering later that he had killed the object of his desire. He was overcome with remorse and became a monk (changing his name to Mongaku) and spent three years enduring the harshest penance, praying beneath the Nachi Falls in the freezing winter, the subject of many ukiyo prints. At the point of death, he is rescued by Fudo Myo (the Buddhist deity of fire) and by Kannon, the goddess of compassion. 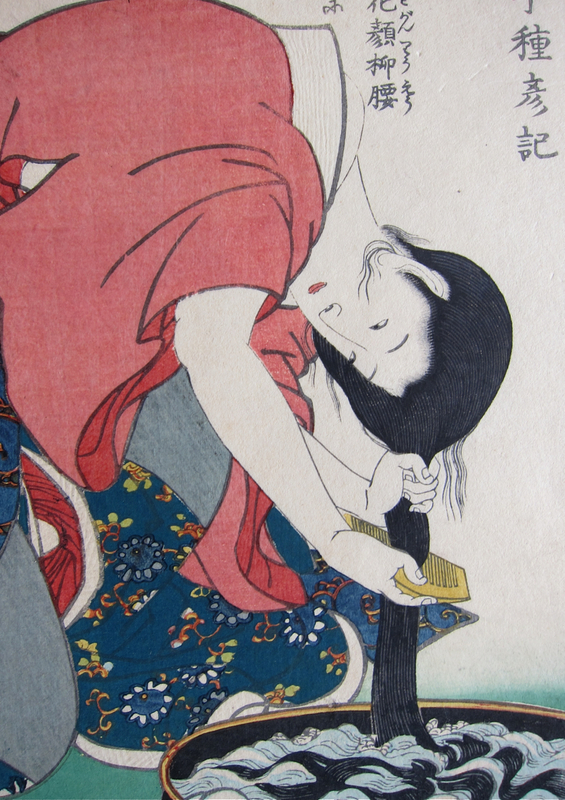 A fine print and one of Kunisada’s famous and widely reproduced images. The print is in very good condition. Fine colour and impression and untrimmed.